Yesterday's reveal of the production Chevy Volt got us thinking we should take a closer look at the design features, both inside and out, that make GM's plug-in hybrid unique. We've picked out five exterior and an equal number of interior design elements we feel are most important, and taken a little deeper look at each. 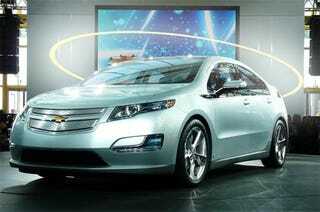 Without further ado, hit the jump for our top ten key design elements that make the Volt so...eclectically electric.